I love fresh pineapple just can't get enough of it. The only thing I have to be careful is fresh pineapple sometime gives me mouth ulcers. I love stewing pineapple for a short while with a little sugar and a few strips of lime zest, that's nice and helps to avoid ulcers. 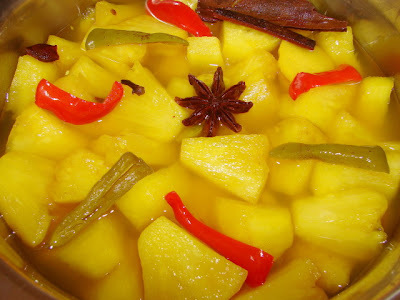 Lately I found stewing pineapple with spices is very tasty and I can have it with a meal. This recipe is my current favourite side dish at the moment. It's lovely and fat free. So easy to make just simmer pineapple with spices and water. It's kind of like a pickled spicy fruit. I love it cold but it is also great serving it at room temperature. Nice with a rich meat curry meal. Put water, whole spices (except chillies) and turmeric powder in a saucepan and let it simmer for about 10 - 12 minutes till the liquid is very fragrant. Put in remaining ingredients and let this simmer for another 10 - 15 till the liquid is hot and steaming but not boiling. Stirring a few times so the pineapple is coated with the spiced liquid. Heat off, cover and leave to cool. Serve at warm temperature or keep in the fridge till cold. Note: Do use stainless steel, glass or enamel coated pan. If you use aluminium or bare cast iron pan or spun steel wok, the pineapple could be discoloured and tasted metallic. If you have a lot of the juice left you can use it to make a spicy sweet and sour sauce just simmer and thicken with cornflour. You and I are in the same page when it comes to pineapple. It's too bad that the pineapple here aren't as sweet as the one back home. Fresh pineapple with some sambal belacan (terasi) is great with rice, nothing more needed.